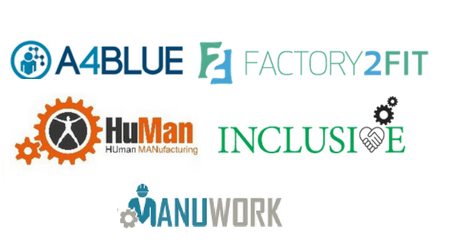 Five Factories of the Future projects (A4BLUE, Factory2Fit, HUMAN, INCLUSIVE, and MANUWORK) have joined forces to from a cluster focusing on worker-centred manufacturing. The cluster will be a forum for sharing projects’ knowledge, progress, and results as they emerge. Stronger global position of industry in Europe through higher social acceptance levels. By combining their efforts, the projects hope to achieve greater impact and wider adoption of these new developments in advanced manufacturing systems. In the coming months, the cluster will be setting up a website to share news and updates.